Well, I have a four year old colt that I got from my friend Clint Branger. He’s out of an AQHA registered “Kessler” mare and by one of Clint’s bucking horse studs, so he’s not exactly saddle bred. So here I am, trying to make him a saddle horse! He’s a big rangy brown with white socks and a big star on his forehead, a friendly demeanor and a kind heart; so far anyway! I started him a while ago with the first ride just being a simple deal; getting him ready to get on and then a small ride around the round pen with a rope halter on. The second ride I attempted today, I caught him and tied him to the fence and sacked him out with my favorite object; my cowboy ‘hula skirt’ (also known as armitas). After which I saddled him and sorta lunged him in a few circles to check him out and loosen him up so he wouldn’t launch me into orbit. As soon as I was satisfied with him, I led him out to our outdoor round pen and turned him loose to trot around and get acquainted with the saddle some more. We have a slicker hanging on the fence, so I grabbed that and flagged him with it until he was used to that too. Then I caught him and messed around just being sloppy so that when I crawled on he would be pretty much used to something hanging off the side of him. I have to make sure and remember to work both sides of my horses so that they don’t get one sided and off balance. All this took about an hour from the time I caught him until I thought he was ready to be ridden. Then I put a snaffle bit in his mouth and put my foot in the stirrup. I climbed on about half-way and waited until he stopped moving; keeping his hindquarters coming around so as to maintain control of this potentially dangerous animal. When he stopped moving I stepped off to show him that relief comes from standing still while I struggle to get topside. Then I climbed all the way on, doing my best to make that feel like as good a thing as possible for him. I walked him around some and he behaved just fine, until my hat took flight and came to rest on the ground beside him… then he took a couple short jumps and I knew what was coming next so with lightening fast reflexes I screamed like a banshee, grabbed my rope strap like a ninja and proceeded to ride it out like a monkey. As it turned out, there wasn’t anything to ride out because he jumped twice and stopped like a good boy, which was nice! After I got my cramped hand pried from my poly, I started him out again at a walk, just letting him go where he wanted. 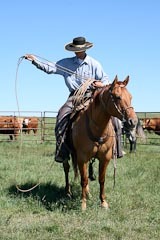 Pretty quick, I started to direct him with the reins and my legs, soon I had him savvying the one-rein stop at a walk. This will help when I move up in gates. A good place to quit if you ask me, so I did. I made sure he was ready for me, so he wouldn’t sell out on me and I’d hit the ground like a fifty pound sack of oatmeal, then I stepped off. A big sigh from both of us confirmed that it was a good afternoon’s schooling for me and Kessler. Hopefully I can produce another story about him and his progress another time! Mike Capron on April 07, 2011 Nice job Jake !! I am proud of you taking on a horse that has a bad label and probably is a pretty nice pony, I don’t like labels on our horses or people. I have seen some mighty fine cowpunchers that wore nothing but bib overalls and some mighty fine bucking horse that made great cowponies. I sure enjoyed your article and I am sure you will get along with Kessler just fine, he is just a horse and he doesn’t know anything about his kin folks, so just clammor aboard and enjoy the ride, you can always get back on if you fall off.